For seniors with memory conditions, communicating their needs and thoughts effectively can be challenging. 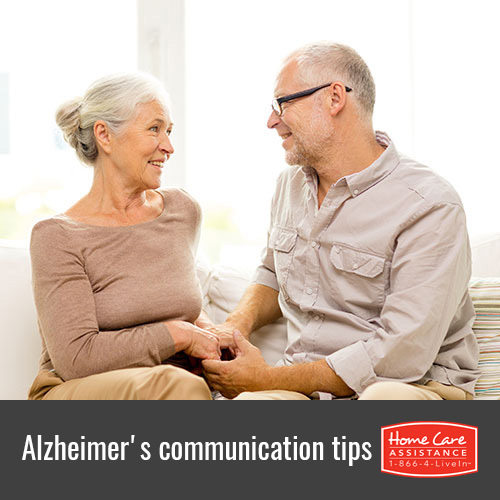 If your elderly loved one has Alzheimer’s, there are some steps you can take to ensure you are able to communicate better with your relative. Read on for five strategies for effective communication from the senior care experts at Home Care Assistance Harrisburg. Seniors with Alzheimer’s may have difficulty keeping their thoughts organized in a logical sequence. This can make it difficult for them to remember the steps involved in daily tasks such as getting dressed. Help ensure your loved one can follow your directions by having family members and Harrisburg Alzheimer’s caregivers use short, precise sentences and provide instructions one step at a time. Individuals with Alzheimer’s may lose their train of thought during a conversation. You can help your loved one focus on the task or conversation at hand by limiting background distractions, such as the television or radio. If your loved one’s mind does seem to wander, try bringing his or her attention back to the conversation by calling him or her by name or touching him or her gently on the hand. As the symptoms of Alzheimer’s progress, your elderly relative may have trouble remembering the names of everyday objects. A visual reminder can help your loved one understand what you are trying to say. So, instead of saying “Would you like coffee?” you can try gesturing at your coffee mug or at the coffee pot. It may take your loved one a while to process conversation and respond to you. While it may seem counterintuitive at first, the best way you can help speed along the process is to remain patient. While you may have to wait or repeat yourself, avoiding the temptation to rush or interrupt your loved one can make it easier and faster to communicate with your relative. If your elderly loved one has Alzheimer’s, our expertly trained caregivers can provide extra in-home assistance, including help with cooking, cleaning, personal care, and safety monitoring, to help ensure that your loved one is happy and healthy in the comforts of own home. For more information about our senior care services, including dementia, stroke, and Parkinson’s care in Harrisburg, dial (717) 540-4663 to speak with a Care Manager and to schedule a free no-obligation consultation.